The journey from Edinburgh, situated in Scotland and London, which is in England is well connected by trains. The trains are run by the following rail operators: Cross Country, Virgin Trains. 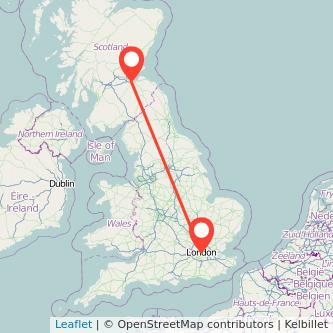 There are 332 miles between both cities and the average train duration connecting Edinburgh to London is normally 5h04m. Travelling by train is normally the quickest solution to go to London from Edinburgh, and it's also more environmentally friendly than taking your car or using the plane. The cheapest ticket price we've found to travel in the next month is £26.50 one way. Find the cheapest tickets to travel from Edinburgh to London by train, bus, ride sharing and plane. Looking at our data, 4 trains from Edinburgh to London are being operated today and 2 tomorrow. The first Edinburgh London train departs at 07:00 and the last one departs at 15:08. The first and last departure times might change from one day to another and there might be fewer services during weekends and public holidays. Rail operators may also adapt the number of trains during school holidays or depending on the season. The Prices for train tickets Edinburgh to London are increasing the closer you get to your departure day. According to our data, if you buy your train 2 months in advance, you can find tickets from £30 whereas when purchasing your seat on the day you're travelling, you will need to spend at least £66 for your train. Thus, you may save 54% on the price of your ticket by booking 2 months in advance instead of on the day you're travelling. We compare train ticket for all major companies to travel between Edinburgh and London by train and find the best prices for the coming days. Take a look at the prices of train tickets London to Edinburgh and find the best deal for your outbound journey. National Railcards can save you a lot if you're using the train. Depending on your age and your situation, you are able to get one of the five existing railcards: Disabled persons, 16-25, Two together, Senior or Family and Friends railcards. Railcards can help you pay less for your Edinburgh London train ticket. In our example, A/B = £30/34% = £88.00. Then, 88/£70.74 = 1.24. Your railcard will be profitable if you're doing around 2 trips from Edinburgh to London (one way trip).